Flatscreen TVs may be more low-profile than ever, but putting one in your living room still means a bleak black rectangle becomes the focal point of your room rather than whatever decor you'd prefer to dominate the space. 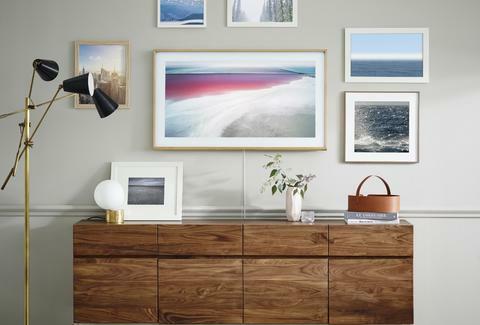 That's what inspired Samsung's forthcoming TV known as The Frame, a top-of-the-line flatscreen that automatically camouflages itself as a piece of customizable wall art when not in use. After initially teasing the product at CES earlier this year, Samsung just confirmed that The Frame will be available later this Spring. The set will come in both 55- and 65-inch versions, and in a handful of different interchangeable frame styles that mount flush to the wall, so you can better match it to your existing space. It'll also feature an all-new "Invisible Connection" cable, that removes the need for any unsightly cables snaking across your walls. Its "Art Mode" will enable you to select from more than 100 art pieces in a number of different categories -- from architecture, landscape, wildlife, drawing, and more -- for it to display whenever you're not bingeing the Golden Girls on Hulu. Though, unlike a digital photo frame or screensaver modes on earlier flatscreens, The Frame auto-adjusts the brightness of the screen based on the light in the room to give a matte effect that makes whatever art's on display appear like a piece you'd walk by in a gallery. It also has motion sensors that will turn the display off completely when no one's around. Samsung is mum on many other specs, and hasn't released pricing info yet. However, considering its other batch of forthcoming flatscreens start at $2,800 odds are it will pack quite a punch to the wallet. Joe McGauley is a senior writer for Thrillist. Follow him to stealthily concealed entertainment centers @jwmcgauley.